In late 2013, it was announced that a new type of USB connector would be developed for the first time in 17 years. The main advantage to this new connector, known as the Type-C connector, is that it's fully reversible, meaning it can be plugged in 'upside-down' like Apple's Lightning connector without kicking up a fuss. 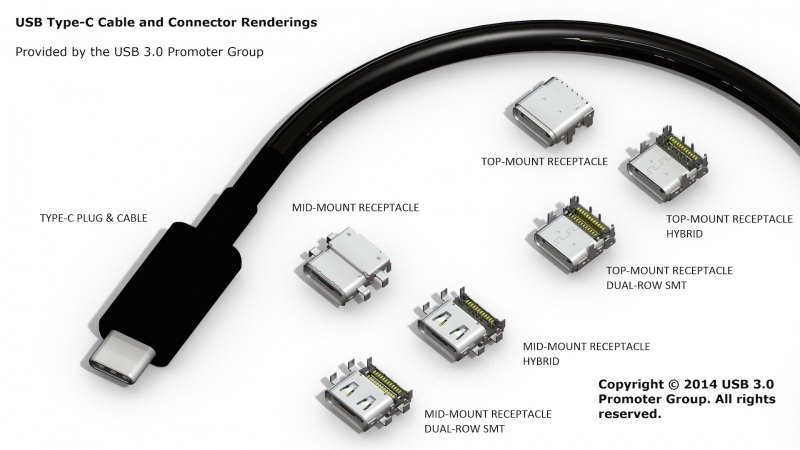 In April we got a sneak peak at what the Type-C connector might look like, and now the USB 3.0 Promoter Group has finalized it. This means it's now ready for mass production, allowing manufacturers to build cables, adapters, and new devices from the specification. The connector itself is a fairly simple rounded-rectangular design, similar in size to USB Micro-B (micro-USB), with 18 pins attached to a center board. It's basically two USB 3.1 connectors in the one package, with either the top set of nine pins or the bottom set being used for data transfers depending on how you plug it in. As the connector supports the USB 3.1 standard, it will be capable of throughput up to 10 Gbps provided you have two USB 3.1-supporting devices. It also supports the USB Power Delivery specification, allowing a USB cable to act as a charging cable by providing up to 100 watts of power. Unfortunately the Type-C connector is not backwards compatible with any existing USB ports. However, it will be possible to create a USB Type-C to Standard-A cable, making it easy to plug a device packing the reversible connector into your PC, which uses the familiar square Standard-A port. Now that the Type-C connector is finalized, we can expect products using it to start appearing in a few months' time. It'll probably take until 2015, though, before we see smartphones - one of the main users of the micro-USB connector - integrating the reversible socket.